This will be the first post of this kind. I did a DIY of a Weekly Menu Planner. I have been using it, although it has a been a long adjustment (I know less than a month and I feel like its been forever). The second week I did not update and the third week I did not really follow it. I had things that seemed to go bad quickly and I went out for dinner/lunch with my Mother the one day. I think I have this figured out though. There are going to be some items that I prepare on Sunday for certain meals. A good example of this would be my dressing for coleslaw. It is a basic cream/vinaigrette so we (our whole family) also use it for all kinds of salads. 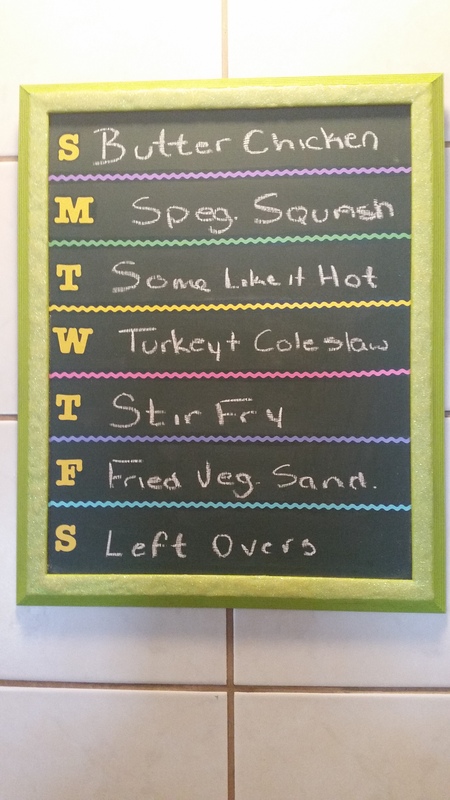 Here is my menu for the week. I like how it looks so hopefully I can stay with it. I will let you know at the end of the week anyways! Monday – Spaghetti Squash, this all depends if the squash is still good or not. I will use a red (tomato) sauce and also add a meatless chicken cutlet. I think its similar to a chicken parmesan (I could be wrong but it might be healthier too). I love it! Wednesday – Turkey and Coleslaw, for the most part straight forward. I will still have NAAN bread left over so I will use a piece of that. Top it off with coleslaw and the turkey burger. Maybe a couple other ‘burger’ toppings depending on how I feel. Thursday – Stir Fry, the type will all depend on what I am feeling that day. Friday – Fried Veggie Sandwich, what ever veggie I need to use up in the fridge will get fried. Saturday – Left Overs, now if there are no left overs I consider it an open day for what ever I feel like having.